Fossil fuels (i.e., petroleum, natural gas and coal), which meet most of the world’s energy demand today, are being depleted fast. Also, their utilization is causing global problems, such as the global warming, climate change, ozone layer depletion, acid rains, oxygen depletion and pollution, which are posing great danger for our environment and eventually for the life in the planet Earth. Many engineers and scientists agree that the solution to these global problems would be to replace the existing fossil fuel system by the Hydrogen Energy System. Hydrogen is the most efficient and the cleanest fuel. Its combustion will produce no greenhouse gases, no ozone layer depleting chemicals, little or no acid rain ingredients, no oxygen depletion and no pollution. Of course, hydrogen is a synthetic fuel and it must be manufactured. There are various hydrogen manufacturing methods such as direct thermal, thermochemical, electrochemical, biological, etc. Among the hydrogen production methods, biological method has the potential of resulting in the most cost-effective hydrogen. Because of this, many research groups around the world are working on biological hydrogen production. In several cases, bench scale production systems have come up with encouraging results. 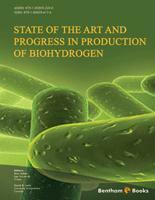 This eBook entitled “State of the Art and Progress in Production of Biohydrogen” covers the biological hydrogen production method authoritatively from A to Z, including mechanisms of hydrogen production, hydrogenase genes and enzymes, photosynthetic methods, photo fermentation, thermophillic fermentation, dark fermentation, metabolic engineering, electrohydrogenesis and immobilized cell systems. I strongly recommend this excellent eBook to energy scientists, engineers and students who are interested in hydrogen production in general and biological hydrogen production in particular, as well as to industrial concerns who are looking for inexpensive hydrogen production technologies. Three of the great challenges facing humanity in the 21st century are energy supply, climate change, and global food security. Although global energy demand is expected to continue to increase, the availability of low cost energy will continue to diminish. Coupled with increasing concerns about climate change due to the CO2 release from the combustion of fossil fuels, there is now an urgent need to develop clean, renewable energy system. Hydrogen is a clean, zero carbon emission, and renewable energy carrier, with a high specific heat of combustion. Hydrogen can be used in internal combustion engines to generate mechanical power or in fuel cells to generate electricity. As hydrogen can be produced from many natural sources, it is expected to have a stable price in the future, independent of the fluctuation in price and availability of single sources. Hydrogen also allows flexibility in balancing centralized and decentralized power supply. The use of biofuels for transport is becoming of increasing importance due to the environmental concerns relating to climate change, depleting fossil fuel reserves, and reducing reliance on imports. This is leading to international, national and regional focus on alternative energy sources. In the EU, transport is responsible for an estimated 21% of all greenhouse gas (GHG) emissions. A range of actions is being taken to reduce emissions from transport such as promoting the use of biofuels. Among alternative biofuels, hydrogen seems to be more advantageous due to the fact that it has a higher specific heat of combustion and does not contribute to the Greenhouse effect. Among other alternative production methods such as pyrolysis, gasification, steam gasification, steam reforming, and electrolysis which are highly energy intensive processes, biological methods are promising both in terms of ecological and economical reasons. On the other hand, if biohydrogen systems are to become commercially competitive they must be able to synthesize H2 at rates that are sufficient to power fuel cells of sufficient size to do practical work, and further research and development aimed at increasing rates of synthesis and final yields of H2 are essential. This eBook aims at contributing to this target. We hope that the chapters contained within this eBook will be useful and inspiring for many researchers and people who have interest in hydrogen.